Your personal slice of Maui. Steps from the ocean. Hidden away yet so close to all of the Island's attractions. Wake up to a beautiful view of Maui's Honokowai coast in your oceanfront, 1 bedroom, 1 bath condo. 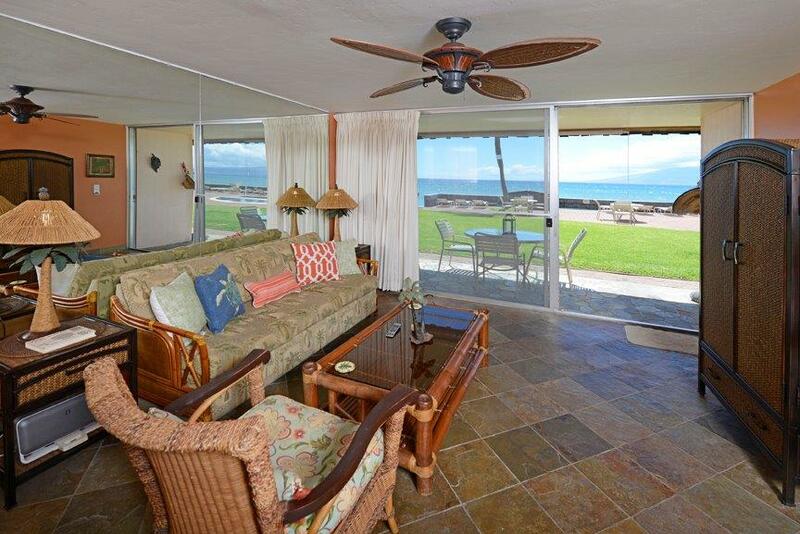 Kulakane #106 features many updated amenities that will enhance your Hawaiian experience. Want to see more? Click on the photo above or link below. And we have even more photos on our booking site which you can access by clicking on Rates and Availability. Booking your slice of Maui is easy. Just click below to our booking site. Rates change depending on the season. Condo living is unbeatable in value and space. Click on above image or link below and see for yourself. You know you want to. Whale watching season is here! From now until May you can see Hawaii's majestic Humpback Whales pass through the channel right in front of your Lanai at the Kulakane. It's truly an amazing experience. The locals say " Maui no-ka-oi", or "Maui is the best". And for good reasons. Never too crowded. Incredible beaches and views. Night life in Lahaina and Wailea. From whale watching to shaved ice, snorkeling and diving to romantic sunset cruises, hiking a volcano or napping on a quiet beach, Maui has it all for the whole family. Just click on photo above or link below and check it out. Beach access is effortless at the Kulakane. Watch the brief video below to see how quickly you can go from your Lanai to the ocean.